Congratulations to Kathleen McCracken for winning the Seamus Heaney Award for New Writing 2019! Kathleen won the award for her poem Chironomy and was presented with the award by Conor Shields and one of the judges Maria McManus. The Seamus Heaney Award for New Writing 2019 was a ‘blind judging’ process (no names were known during the judging). The other two judges were, Stephen Sexton and Damian Smith (from the Arts Council of Northern Ireland). Listen to Kathleen’s reading of ‘Chironomy’ from the event here. 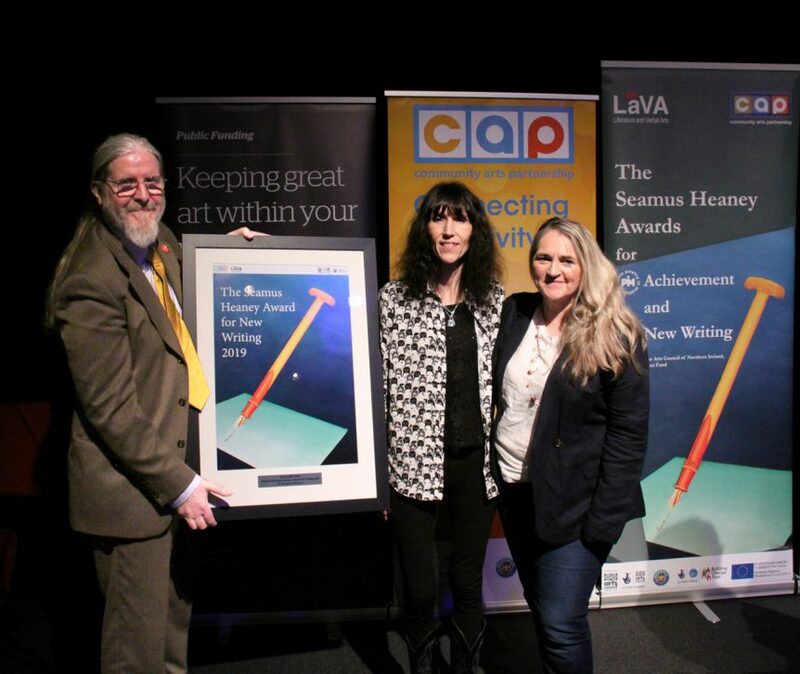 CAP’s CEO, Conor Shields presents the Seamus Heaney Award for New Writing 2019 to Kathleen McCracken (centre), with one of the judges, poet Maria McManus.